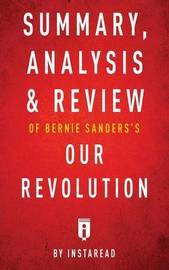 Summary, Analysis & Review of Bernie Sanders's Our Revolution by Instaread Preview In Our Revolution: A Future to Believe In, Vermont Senator Bernie Sanders outlines his career and political ideals. The book includes an autobiographical sketch of his early life, a discussion of his 2016 campaign for the Democratic presidential nomination, and a summary of his views on important national issues. Sanders believes that the wealthy control government institutions and the national media to their own advantage, and that a popular electoral revolution is needed to rein in corruption and give working people jobs, opportunities, and a decent standard of living including equitable access to quality health care and education. Sanders was born in Brooklyn, New York, to working-class parents. His older brother Larry taught him a love of reading. Sanders was the first one in his family to attend an elite university when he went to the University of Chicago. There he read progressive publications, educated himself about political concerns, and ... PLEASE NOTE: This is a Summary, Analysis & Review of the book and NOT the original book. 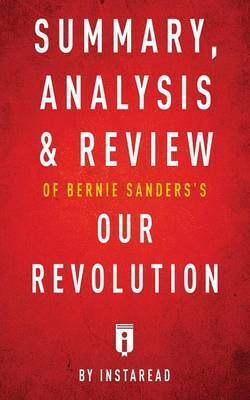 Inside this Summary, Analysis & Review of Bernie Sanders's Our Revolution by Instaread Overview of the Book Important People Key Takeaways Analysis of Key Takeaways About the Author With Instaread, you can get the key takeaways and analysis of a book in 15 minutes. We read every chapter, identify the key takeaways and analyze them for your convenience. Visit our website at instaread.co .